Today, I went to a baby shower for one of our young ladies at church. This will be their second child. They already have a girl, and this one is a boy. Whenever I get a gift ready for anyone, I like to make it a little personal. I know how much I loved collecting ornaments over the years for my children, and have learned that many other moms like to do that too...so...I decided to make an ornament for this new little guy. Since he is going to be born in Louisiana during the Mardi Gras Season, I thought I'd use that theme. I used old guitar strings. After making sure they were nice and clean, I wrapped them with gold wire, then wrapped the strings with green garland and added the baby's name. 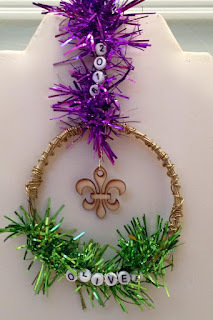 I took an ornament wire hanger and wrapped it with purple garland and added the year. 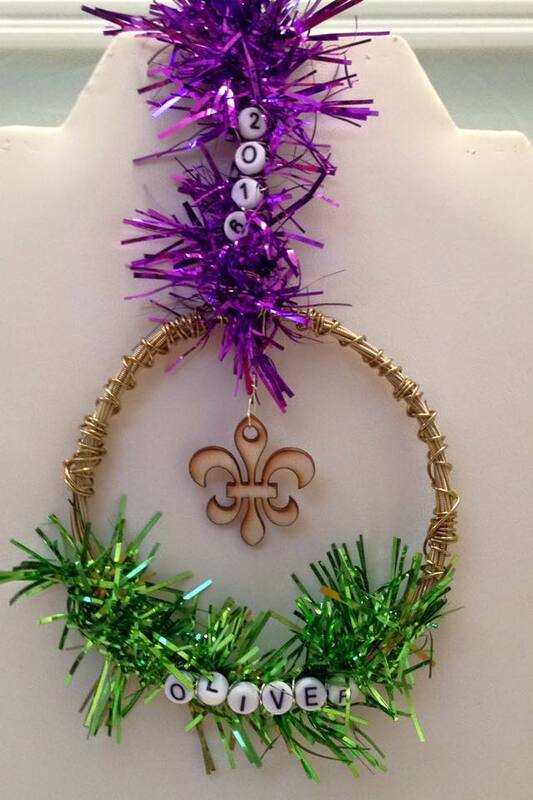 Then, of course, I had to hang a fleur de lis in the middle. She likes to put one to two drops of oil with fractionated coconut oil into a 10 ml bottle. Frankincense up the spine, the digestive blend on the tummy, and the respiratory blend on the chest, This she does both in the morning and at night before bed. In the morning she likes to use protective blend if the baby is not feeling very well, and the joyful blend. At night she uses lavender and the grounding blend. All this on the bottoms of the feet. If her little one seems a bit grumpy anytime, she will use the lavender and the grounding blend on the bottoms of her feet. I really wanted to make all these up for my friend, but noticed I only had two glass roller on bottles, so that was not going to happen. I asked my daughter what her favorite was, and she told me if she could choose only one, it would be the lavender. So, lavender it was. Ten ml bottle, two drops of lavender essential oil, and fill up with fractioned coconut oil. Boy, it sure smelled nice, and mom really was excited to get it. Just a few weeks ago, I received a shipment of some fun stuff from The Bargain Bead Box. I even did a review of what I got, and so did my sister, Tammy Powley. Here are the links....ME; my SISTER. Now that I have had them for a little bit and playing around with the stash, I now want to share with you what I came up with. I'll first start out with the earrings. I love crystals, and we got a bunch of them! I just love the way these turned out. I started playing with the crystal beads that were sent. I came up with this 32" crystal bead necklace. It can be worn long or short at 16", which is perfect for me! That is the length I like them (16"). So, here is the whole ensemble put together. I love to make things that can be worn different ways. This can be worn with both necklaces, or separate, and the crystal piece can be worn as a short necklace. This time last year, my mom and two sisters and I were trying to figure out what we wanted to do for a mother/daughter trip. We went round and round with various ideas. My mom and I love to cruise, but one of my sisters hates to cruise. My other sister and I are pretty much open to whatever, but I am a bit more price conscience that she is. In the end, we did book a cruise. It was a three day with Disney. Even though we could have gotten a cruise with Carnival for A LOT less, we found one on Disney that was reasonable. Besides, we were curious about how Disney compared to Carnival and Royal Caribbean. Maybe my sister who is not a fan cruising will like Disney better. I actually posted videos about our cruise on my tappingflamingo youtube. I will admit, it was fun, but I probably will not be cruising with Disney again, unless someone else wants to pay for it, lol. One thing I thought was fun on Disney was what they call Fish Extenders. I also have a few videos on this too. Fish Extenders are actually a type of gift exchange. I know it is very popular on these cruises, and many people get involved with them. So....I decided that maybe I could offer some Fish Extender gifts over on my Etsy shop. One thing I have over there are Pipe Cleaner Princess Rings. 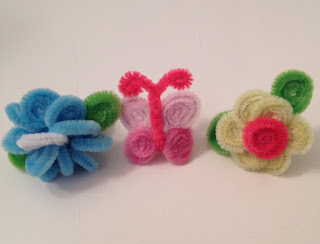 I actually made these for the little girls in our FE group. I have made these in the past for bridal showers and little girl birthday parties. They are a hit for both young and old. One other thing I have in my shop are Beaded Pirate Dreadlocks. I actually stole this idea from my sister. This is what she made for her FE people. I asked her if I could make some up for my shop, and she said, "Sure!" So I did. In our Day 1 Disney review video, you will notice we are wearing some of these dreadlocks. 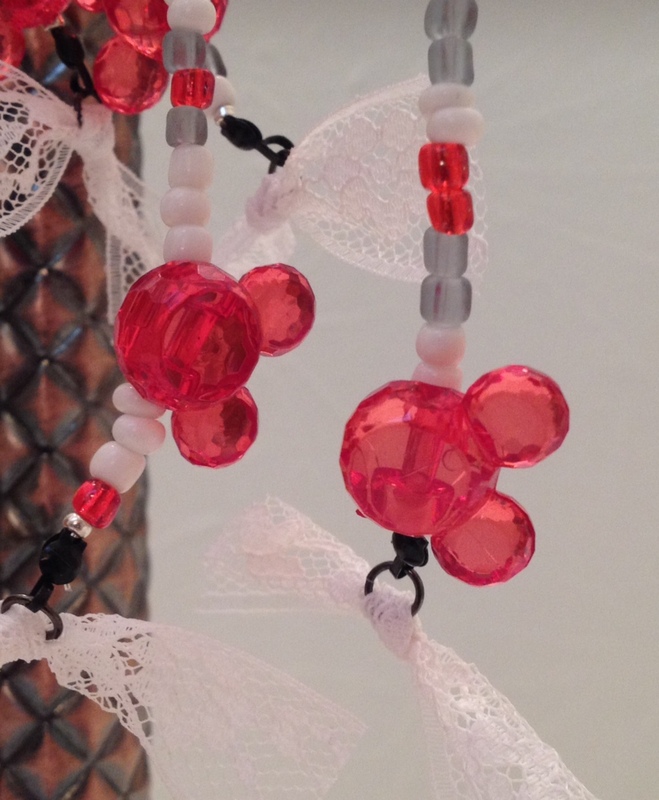 Some of them I put mouse beads onto and added some lace. Some I put butterflies onto. Disney is not the only cruise line that does gift exchanges. On our last Carnival cruise, we had a group that did one and it was pretty fun. I made everyone a Ninja Star. We were on the Sunshine, so I thought it appropriate to do a sun for everyone. After all the sun is just a giant star. By the way, I do have a video on my youtube channel that shows how to make them. 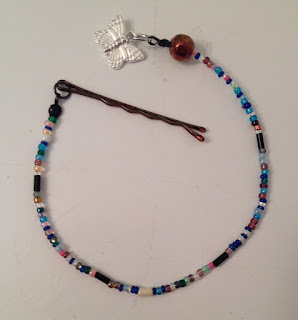 Look what I'm doing again...Yep the NINTH Bead Soup Blog Party. I can't believe this will be #9! I am really excited about it. So, what is a Bead Soup Blog Party you might ask? Well, it is an event that you get paired with another beader. You trade beads, and then create! Then, on March 12, you post a blog about who your partner is, what you sent them, what they sent you, and then what you created. March 12 will be a very busy day with people hopping around reading about all kinds of things creative people made with their bead soup. Links For Some Fun Craft Stuff! I was so excited to get this book because I really enjoy watching The Chew. The pictures are great, but wish there were more. I love seeing lots of pictures in cookbooks. I love the way it is set up. After introducing themselves and the book, Michael Symon and Douglas Trattner tell you what needs to be in your pantry for efficiency and quickness. They call the pantry their "toolbox." The chapters are set up by season; Spring, Summer, Fall and Winter. There are some yummy looking dishes in each season. One problem I see, at least for me, is that a lot of the ingredients are going to very hard for me to find. I live in an area that really only has one grocery store...and everyone knows the one, the one that I have a love/hate relationship with. It's big and inexpensive. Anyway, I have a hard time finding those interesting and unusual foods there. Several years ago, wearing earrings like this were pretty popular. Mismatched, that is. I've always heard that styles will come back, and you know what? I think these are making a comeback. 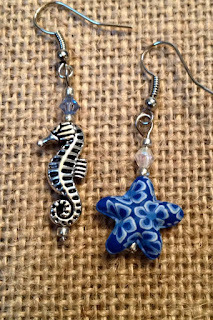 I love anything beach or tropical and when I saw these seahorse and starfish beads, I could not resist. The starfish came in all colors, pink, yellow, green, blue, and there were two of each, except the blue. I thought about making a necklace or pendant, but then I remembered about mismatched earrings. I started playing around and thought these two made a great pair. I love them! 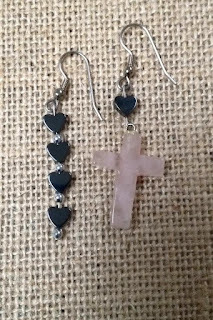 Here is another mismatched pair. Sorry the picture is not as good. 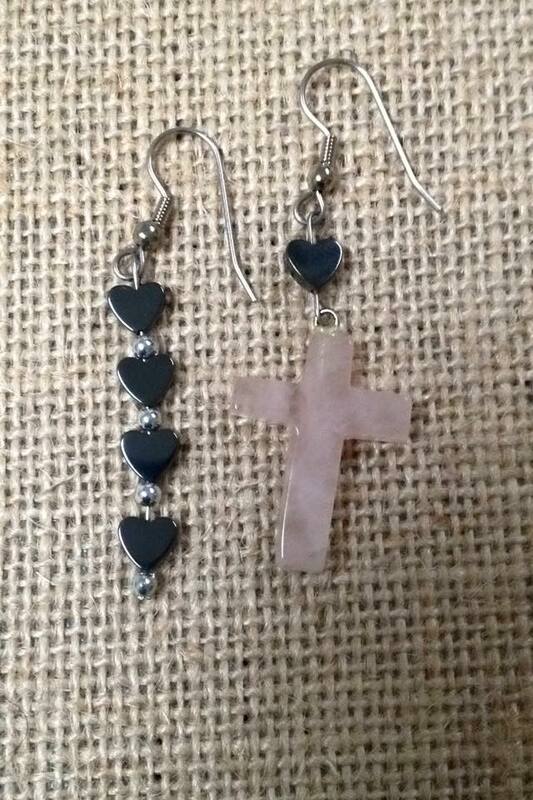 These are made of hematite hearts and a rose quartz cross. I have had some positive feed back on them, so I think I might be adding them to my etsy shop soon. 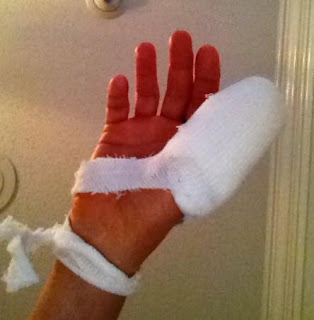 It's almost been a month since I had a cyst removed from my thumb. In a couple days, I head back to the doc one last time, and I think he is going to be pleased with how I have healed. One thing I am not pleased with, though is that two days after I had surgery I got really sick, as in...I was in bed for three days with a 102 fever and only got out of bed to go potty (sorry too much info...). My husband tried to get me to eat, but I had zero appetite. Finally, on the fourth day, I forced myself out of bed and thought I was getting better, until day eight. I got worse. Fever back up, and a MAJOR sore throat. That was a Sunday, so the next day, Monday, I went to a walk in clinic and was diagnosed with mono....REALLY? Aren't I a little old for that? I was told that they had so many cases this year of mono...no flu, but tons of mono. hmmm....Well, I did have all the symptoms, fatigue, fever, no appetite, a SORE throat and huge swollen glands. I remember our oldest son having mono when he was in 2nd grade, and started to think back. I remembered that he was out of school for six weeks, and no sports or play, and that he was sooooo tired. I called my regular doctor, and they told me not to pick anything up or dance, or yoga, or anything for at least six weeks. I guess your spleen tends to swell and they don't want it to rupture. Well, my fever has been gone for about two weeks, so I am not contagious anymore. But the fatigue and lack of ambition is horrible. I have so much I need to do, but just can't. I have started to do a bit of research about mono, and have found that it is an Epstein Bar infection, and that it is unheard of for anyone my age to have it. Really? So what is it I have? And, what can I do about getting my energy back? Yesterday, I tried to do a bit too much. I took down Christmas Decorations, drug boxes all over, did laundry, including changing sheets on the beds, made some jewelry, posted onto my etsy shop, cleaned out the fridge, and, boy, from about 2pm on, I was worthless. I could hardly move. As I continued my research, I found that I could have a relapse, so I am going to try to take it easy. Baby steps. So grateful that my husband understands. I slept in today, ate a good breakfast, worked on my lesson for my Institute kids, posted a pair of earrings on my etsy, went through my closet and got rid of some clothes. That is pretty much all I am worth today. I sure hope I am back to normal by Feb 1! I want to go back to my yoga and dance classes. One good thing about this, I did loose six pounds. Yep, even over Christmas, I LOST weight. Hoping I can keep it off! But, my main goal now is to get better and get back to normalcy. I have a lot of do before summer, and tons going on this summer, and I plan to be 100%! Dry Gulch Beads and Jewelry is having a challenge. This challenge is a monthly challenge. For the month of January 2016, the inspiration is "the frosty world around us." 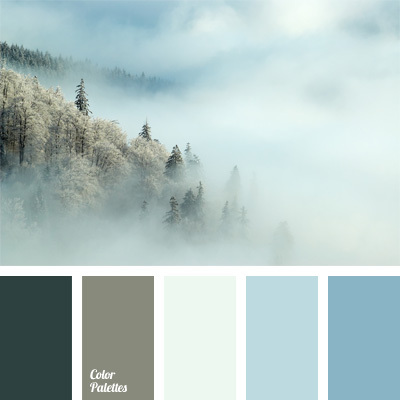 The colors were chosen from what we typically think of as winter colors. I think these colors are absolutely gorgeous, but growing up in Florida, these colors don't remind me of winter, but of summer. 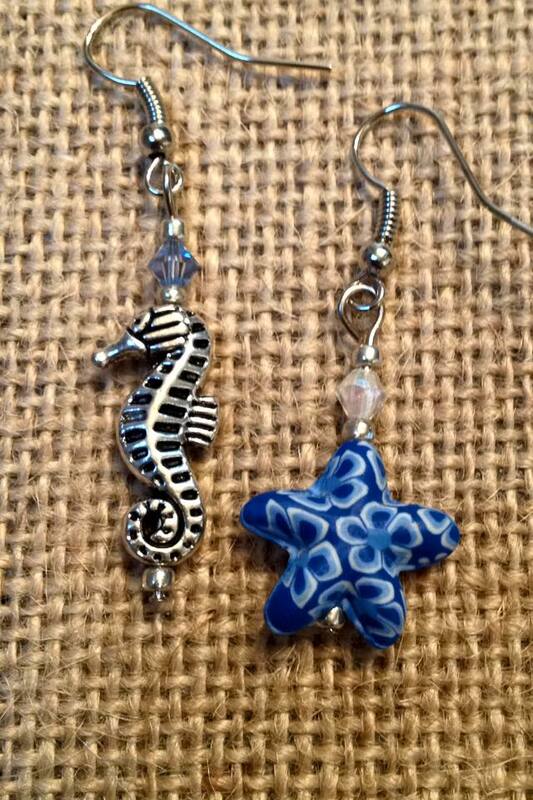 So I kinda went out of the box and created beach themed earrings using these "winter" colors. I used navy and white coral looking starfish beads. The navy starfish I topped with white crystals, and the white starfish are topped with blue aurora borealis crystals. Then we have the sea turtle earrings. They sit upon a blue sea glass looking bead with white dots. Happy 2016! It seems the older I get the faster time goes by. I cannot believe it is already 2016. Now that is the beginning of a new year, everyone starts thinking about New Years Resolutions. Not me, though. I am really tired of making goals, and then not keeping them. This year, I decided I was not going to make a resolution. It is just a waste of time, almost a mockery. I think that we should continue to make goals through out the year, not just at the beginning. Small goals are the best. Oh, and goals that are specific and achievable. So, even though I did not make a New Years Resolution, I did make a goal. It is a goal that I have accomplished on several occasions, but one that I feel I need to continue to do, over and over again. My goal is....to read the Book of Mormon. To pray about it, and to reconfirm my testimony of this book. For those of you who know nothing about this book, it is such a good book. It is another testament of Jesus Christ. It is a book that bares witness of His life and Atonement for all of us. Just like the Bible, The Book of Mormon was written by prophets. But these prophets lived in the Americas. Before I ever read the Book of Mormon and joined the church, my family went to another church. My mom was a Sunday School teacher. When she started to read the Book of Mormon, she found that what she read and learned form this book enhanced her lessons greatly. She did eventually join The Church of Jesus Christ of Latter Day Saints. I look forward to once again, read and study and pray about the Book of Mormon. In our Sunday School class this year, we are studying this marvelous book, and I look forward to the things that we will learn and discuss. "3 Behold, I would exhort you that when ye shall read these things, if it be wisdom in God that ye should read them, that ye would remember how merciful the Lord hath been unto the children of men, from the creation of Adam even down until the time that ye shall receive these things, and ponder it in your hearts. 5 And by the power of the Holy Ghost ye may know the truth of all things." This is a great challenge and one that should be used when studying the Bible too. Read with a sincere heart, and real intent, and having faith that by the power of the Holy Ghost, you will know if these things are true. That is what I plan to do. Read, study, and ask with a sincere heart, real intent and faith. I have done this on several occasions, and I continue to get the same answer that The Book of Mormon is the Word of God. One may ask why read the scriptures over and over? Well, we need to continue to read our scriptures because they guide is in our lives. It is a way for us to be close to God and to know Him. Many times answers to questions will come when we study our scriptures.